Spinning and static training takes place through the winter months. Spinning sessions are held at Kendal Leisure Centre on Tuesday evening – see Facebook for more info. Blocks of 7 week sessions are £28 and run by our coaching staff. The new Leisure Centre bikes provide readouts now so don’t forget your HRM! (and a towel & drink). 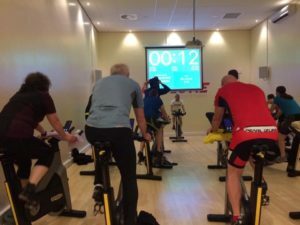 If you can’t make the spinning check out the other sessions we have access to at Mapdec Coached again by our Head Coach Paddy along with another British Cycling Coach Iain Childs. Bring your own bike to these sessions and get setup on the Tacx Turbo Trainers – see Mapdec website for more info. As a club member you will be invited to the club Facebook page where members share and organise informal rides alternatively you could join one of the many local rides organised by Giant. As a club we have a close relationship with Giant and they offer many rides for all abilities as well as Liv Ladies rides too. Head over to their Facebook page for more information but don’t forget to shout up as other club members might want to join you! Throughout the year and as interest dictates we are able to hold drill sessions in traffic free environments as well as organise trips to the Velodrome for some track time.